British pioneer aviatrix. The first woman to fly solo from England to Australia. Signed photograph showing a smiling Amy Johnson, head and shoulders, in flying coat and cap, with goggles pushed up. 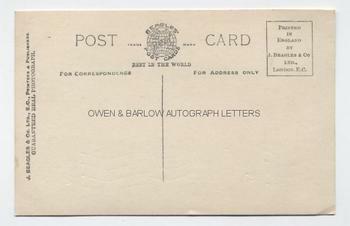 With a good, clear autograph signature across a light part of the image. The photograph is a real photograph post-card by Beagles measuring approx 5.5 x 3.5 inches. In fine condition. Amy Johnson established several records in the air, sometimes solo and sometimes with her husband, James Mollison. Her most remarkable achievement was her solo flight to Australia in her Gipsy Moth biblane, "Jason". The flight covering 11,000 miles from Croydon, London to Darwin took 20 days between 5th May and 24th May, 1930. During WW2, Amy Johnson was a First Officer in the Air Transport Auxiliary and one of the group of remarkable women who became ferry pilots for the delivery of Spitfires and other warplanes from the factories to the RAF airfields. The aircraft they flew were unarmed and without modern navigational aids. In 1941 she disappeared whilst flying an Airspeed Oxford from Blackpool to RAF Kidlington. Bad weather had forced her to divert or else become lost and her aeroplane ran out of fuel above the Thames Estuary, where she baled out. Her parachute was seen to land in the water but attempts to rescue her failed and her body was never found. Some reports suggest that her aeroplane might have been engaged and damaged by a German fighter but this has never been proved. This signed photograph dates from the 1930s shortly after her celebtated flight to Australia. 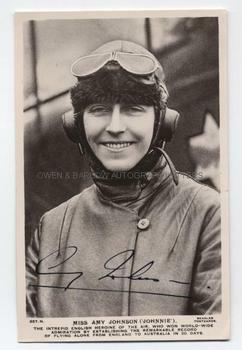 Her early death made her autograph relatively uncommon and it has always been a key autograph in the field of aviation.